Pulp Fiction is a 1994 film written and directed by Quentin Tarantino. Samuel L. Jackson stars as Jules, a contract killer who can talk about French McDonalds just as easily as he blows people’s heads off. 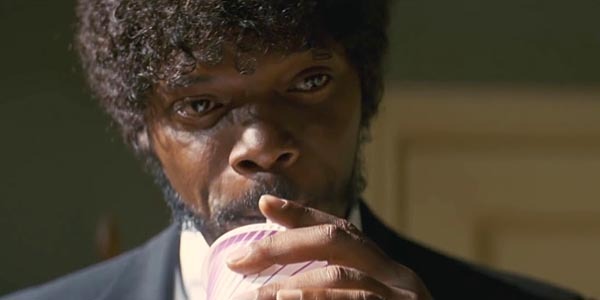 Pulp Fiction is considered one of the best films ever made, and Jules is one of Jackson’s most well-known characters, with lines that can be (and have been) quoted endlessly. So, it’s no surprise that Captain Marvel, which takes place in the same decade as Pulp Fiction, decided to throw in a couple of easter eggs to the Tarantino film. These easter eggs were spotted by a fan on Twitter and it’s hard to deny that they are callbacks to Pulp Fiction. One reference is a shot of young Nick Fury and Agent Coulson driving in their car, which almost perfectly mirrors a similar scene in Pulp Fiction. The framing here is almost the exact same, but if you wanted to play devil’s advocate, there are only so many ways to film two people sitting in a car. The second easter egg is a little out of left field. During Captain Marvel, the Skrull leader Talos appears and for some reason he’s drinking a soda. Talos is a funny guy, but it’s pretty random in the movie…until you realize it’s probably a Pulp Fiction reference. Jackson’s character Jules takes a sip from a soda cup that looks near identical to the one Talos uses. Jules was drinking the soda as a power move right before he was about to murder some guys, while Talos was presumably just thirsty. This isn’t the first time the MCU has snuck in a Pulp Fiction reference either. In Captain America: The Winter Soldier, Fury’s tombstone has a quote about the righteous man, which is part of a biblical passage that Pulp Fiction‘s Jules memorably references. Even Star Wars couldn’t help referencing Pulp Fiction on Mace Windu’s lightsaber. You might be able to spot more Pulp Fiction and ’90s references in Captain Marvel, which is out in theaters right now. Learn as much as you can before your showing with our what we know so far guide. For everything else that Marvel has coming down the pipeline, check out of Marvel movie release guide.